Amber was thrilled for us to be chosen to review Egglo Entertainment. 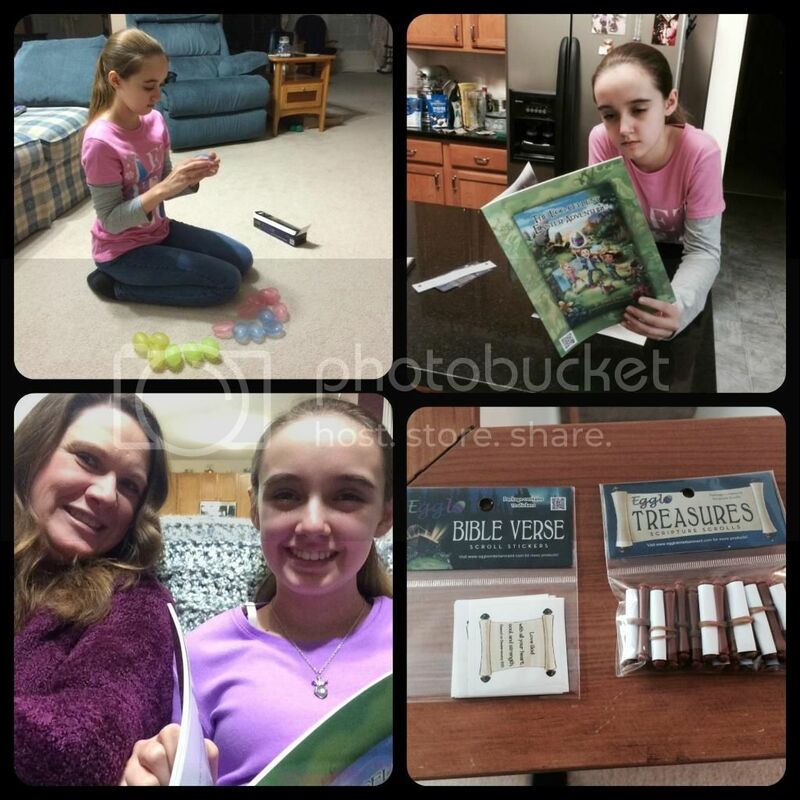 She has always been all about the Easter eggs, even now that she is 13 years old we still have our indoor egg hunts each Lent. The Egglo Glow in the Dark Egg Hunt Event Curriculum (digital version). As soon as the package from Egglo Entertainment arrived Amber begged to open the eggs immediately, but we had events scheduled the rest of the day. The following day I let Amber loose with the Egglo Eggs. She happily assembled her eggs and immediately began charging them under the lights in our family room. The Egglo Eggs come in a package of 12 glow in the dark eggs: 3 yellow, 3 green, 3 blue and 3 pink. Some eggs are plain, while others have a cross embossed on the eggs. The packaging provides information on several methods to charge the eggs to allow for glow in the dark ability. We choose to simply let them sit for nearly hour under the CF overhead lights in our family room. However you can also use sunlight with 20 minute exposure, fluorescent lights exposed for 30 minutes, or home incandescent lights for 45 minutes. The glow in the dark effect works at its best for an hour, but is still visible for 2-3 hours. The eggs are reusable, so when they stop glowing you just charge them up again and again. And believe me, we did. Only after she had the eggs charging did Amber realize there was more than the eggs in the package. The Treasure Scripture Scrolls were a huge hit. They are plastic & paper miniature scrolls that actually unroll with Bible verses printed on the scroll. The scripture stickers were immediately put to use to decorate Amber's confirmation notebook. The Egg-cellent Easter Adventure book was a big hit. I had intended for us to sit down, like we had when she was younger, and read the book together. Yes, I know she is 13 years old and doesn't need my help reading. Still, I thought it would be fun to do and I'm sure it would have. However, Amber was too excited about the whole set and read the book standing at our kitchen island. We did eventually read it together like old times and it did not disappoint. It's a story about a special glowing Easter egg hunt that takes the main characters to many locations while they learn through Bible verses about how God wants us to behave and treat others. At the end of the hunt the characters learn what the true treasure of Easter is. After reading the story Amber understood more the purpose of the Treasure Scrolls and placed them in her eggs before our indoor glow-in-the-dark egg hunt. We read through the Glow in the Dark Hunt Event Curriculum for ideas, but it is geared more for a larger hunt with more than one person. The Egglo Glow in the Dark Egg Hunt Event Curriculum does have a wealth of information on running your own glow in the dark Easter egg hunt. There are decoration suggestions and creative ideas for providing Easter themed snacks during the egg hunt. The curriculum also provides multiple options to include a lesson based on Jesus being the light of the world prior to your egg hunt. The lessons have questions and answers, activities, and memory verses. Even a detailed guideline for those running the hunt is included. It separates tasks in to items to do before and during the egg hunt. The curriculum doesn't leave you searching for your own invitations, activity pages, coloring pages, egg fillers or decorations either. These full color items (except the coloring pages) are included with the Egglo Glow in the Dark Egg Hunt Event Curriculum. It's quite an impressive guide and I wish I had half of these options when holding Easter egg hunts for our church. For our own egg hunt at home, we had tested the eggs after about an hour under the light to ensure they were working. We went ahead and left them charging though until it was dark enough and we were ready to hunt. It's not been the most pleasant weather here and we decided to have an indoor glow in the dark hunt. I hid the Egglo eggs for Amber, then we turned off all the lights. She had to hunt them with a flashlight only. It was probably one of the best egg hunts we've had since Amber learned to actually look for the eggs. 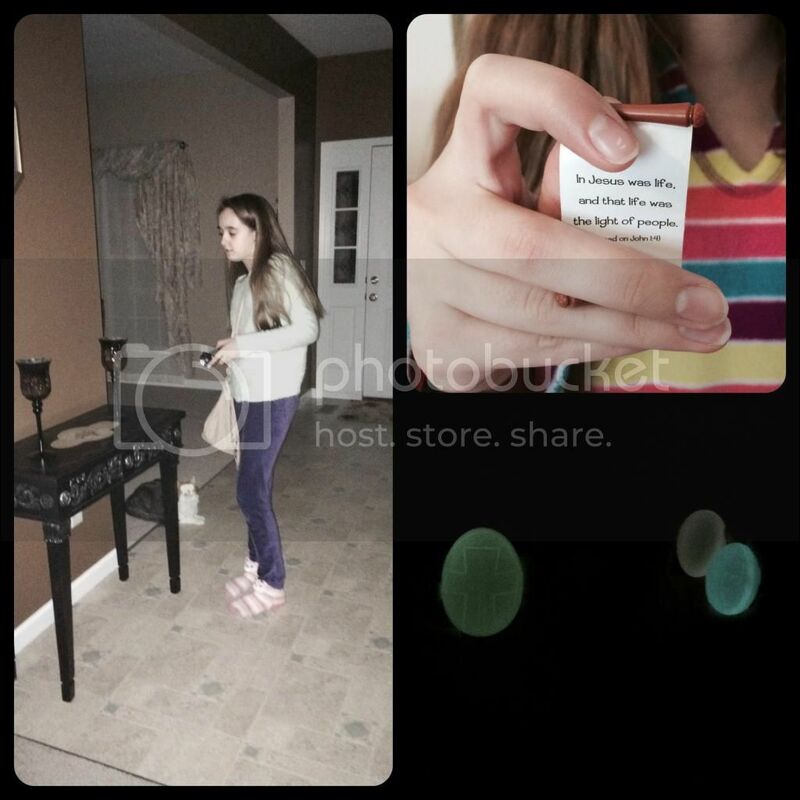 Do you know how hard it is to take pictures of a glow in the dark Easter egg hunt? I ended up having to use the flash. We have continued to have several glow in the dark hunts since receiving the Egglo Eggs. It has been a fun way for us to begin our Lent religion lessons, especially since Amber is in confirmation and most of her lessons are more theological these days. 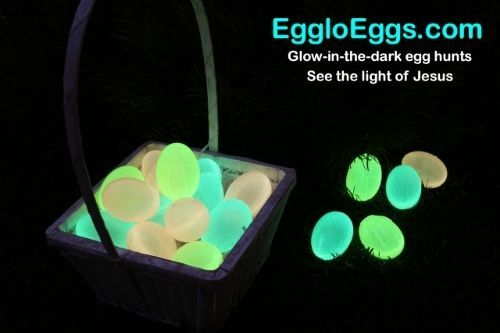 If you are planning an Easter hunt for your church or another group, have a family that loves Easter egg hunts, or even just a single child that enjoys a good egg hunt and Bible lesson, then the Glow in the Dark Egglo Eggs are definitely a product I would recommend. Be sure to check out more reviews of Egglo Entertainment to see what other members of the Review Crew thought of this fun product.